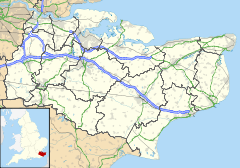 Postling village and civil parish is situated near the Roman road of Stone Street, about 17 miles (27 km) south of Canterbury, Kent, in South East England. Postlinges is the spelling used in the Domesday Book where it was part of the lands of Hugo de Montsort; Postlinge is also seen in old records. There is much archaeological evidence of continued occupation of the area. Postling Place is the old manor house. The population of the civil parish includes the hamlet of Newbarn. The church is dedicated to Saints Mary & Radegund. A junction south of the village is known as Postling Wents; "went" or "vent" is an older Kent word which means "ways". It was once the crossroads where the London to Folkestone road crossed the Lympne to Lyminge road, but is now a sharp bend on the A20. ^ "Civil Parish population 2011". Neighbourhood Statistics. Office for National Statistics. Retrieved 20 September 2016. Wikimedia Commons has media related to Postling. This page was last edited on 3 April 2018, at 04:34 (UTC).